Schema-Archimandrite Lawrence, in the world Luke Evseevich Proskura, was born in 1868 in the region of Chernigov. He reposed on the Feast of Theophany, 1950, and after his death his relics were found to be incorrupt. The Russian Orthodox Church canonized him as a saint in 1993 (commemorated on December 29/January 11 and January 6/19). Besides the gift of healing, St. Lawrence was known for his gift of prophecy, especially concerning events surrounding the end of the world and the coming of Antichrist. His words have striking significance for us today. Chernigov is located in the northern Ukraine, a region that before the Bolshevik revolution and Lenin’s redrawing of the map was more considered a part of Russia. St. Lawrence would have felt deeply for the fate of both peoples without preference, and his prophecies concerning the Ukraine have come down to us. Here are some of those prophecies, translated from the book: St Lawrence of Chernigov: Life and Service to the Saint [Russian](Lestvitsa: Moscow 2003). They are also found in the book [Russian], St. Lawrence of Chernigov: Life, Teachings, Prophecies and Akathist (Holy Dormition-Pochaev Lavra, 2001). The spiritual people who had contact with Fr. Lawrence—Metropolitan Joseph (Chernov) of Alma-Atin and Kazakhstan (1839-1975); Archbishop Simon (Ivanovsky) of Vinnitsa and Bratslav (1888-1966); Archbishop Veniamin (Novitsky) of Irkutsk and Chitinsk (1900-1976); Archbishop Evmeny (Khorol’sky) of Zhitomir and Ovruch (1886-1967); Bishop Iakov (Zaika) of Chernigov; Archimandrite Kronid, Vicar of the Kiev Caves Dormition Lavra; Schema-Archimandrite Prochor of Pochaev and St. Kuksha of Odessa were witnesses to Fr. Lawrence, that he was a great ascetic and Starets—like St. Ambrose of Optina and St. Varnava of Gethsemane Skete. They all conversed with the holy Elder Lawrence, received consolation and help; and to each of them the clairvoyant elder partially revealed the future, which was fulfilled in reality. Archbishops Simon and Andrei and Bishops Iakov and Nestor called Fr. Lawrence a great luminary and pillar of Orthodoxy. 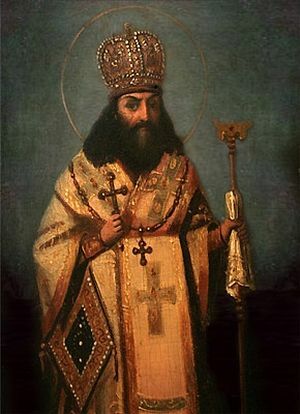 Yes, he was indeed a light of the Orthodox Faith and its bulwark and champion, for he himself never wavered in the unity of the Church and did not associate with the Living Church-Renovationists or the Ukrainian nationalist-self-ordained groups.2 He strengthened the faithful in Orthodoxy. He said that—according to St. Theodosius’ (of Chernigov’s) example—one must hold to unity and not split off. He was always faithful to the Moscow Patriarchate, and enjoined everyone to do the same. Enlightening hearts – so many! Monastics and laymen, not only of Chernigov but also throughout Rus’, who remembered and personally knew the Elder-ascetic and helper in all kinds of need, who turned to him or who heard or read about him, always believed that the soul of the righteous Elder had taken up its abode in the heavenly mansions, intercedes before the Throne of the Lord and Ruler of the Universe, and prays for our salvation. And the Lord did not put their faith to shame: Elder Lawrence was numbered among the choir of monastic saints in 1993. The Psalm-Singer David—saint, king, and prophet—said: “Wondrous is God in His saints!”3… And we the faithful children of the Orthodox Church also say, wondrous is God in Fr. Lawrence. The basis of the material being published here is the Elder’s personal account and the memoirs of his spiritual children, nuns of the convent, who to the last day of his life were with him and near him. I am personally adding what has not been included in previous “Lives” of the Elder, but which has been preserved in various manuscripts. I knew personally and had conversations with all the people about whom I give account and whose accounts I cite. Batiushka—such a loving man—told us: “When a little freedom appears, when the churches and monasteries are being opened and restored, then all false teaching will come out, and the demons and secret atheists (Catholics, Uniates, Ukrainian self-ordained, and others) and will fiercely take up arms against the Orthodox Russian Church, its unity and its conciliar nature.5 A godless authority will support these heretics, and therefore they will take churches away from the Orthodox and slaughter the faithful. St. Lawrence spoke emphatically and strictly, with warning, that the word for our native land and people is Rus’ and Russian.8 “And it’s absolutely necessary to know, remember, and not forget that it was the Baptism of Rus’ (Russia), and not the baptism of Ukraine. Kiev is a second Jerusalem and the mother of Russian cities. Kievan Rus’ was together with Great Russia. Kiev without Great Russia and separate from Russia is completely unthinkable. “The Jews hated the words ‘Rus’ and ‘Russian,’ so at first they called the Russian lands conquered by the Poles and rented out to them ‘Malorossia’ (Little Russia). Then they realized that it contained the word ‘Ros,’ and they named it Okraina13. The word okraina is a disgraceful and humiliating word! What ‘remote, outlying district’? What ‘outback’? Why and for what is it ‘okraina’?! You see, beyond this supposed Judeo-Polish ‘outskirts’ there lie other countries and states. And later, on their same orders, the Poles legitimatized the concepts of the Ukraine and Ukrainians to us, so that we would willingly forget our own name of ‘Russian’ forever, so that we would be torn away from Holy and Orthodox Rus’ forever. Batiushka forewarned us to be faithful to the Moscow Patriarchate and under no circumstances to enter any schism. He warned that the hierarchs and priests who have led the faithful into a revolt have done great harm to themselves and have brought a multitude of Orthodox souls to perdition. “Be cautious of the so-called Church Abroad, and know that it is not in the Diptych of the Orthodox Churches.16 It is not a church, but part of the Russian Church.17 Our much-suffering Church held its own in the godless state. To her [the Church] be honor and glory and eternal praise! Our country is not abroad, and our Church is not abroad! Our country has never ceased to exist! We do not have any “abroad” churches. “The ‘Free Church’ is a heretical name.18 All our churches and monasteries are Orthodox, even the closed ones and the desecrated ones. “The only ones who go into schism and heresy are those unworthy of God’s mercy, and are great sinners, who do not want to know: “I believe in One Holy Catholic (“conciliar”) and Apostolic Church!” Nor do they wish to know that the Orthodox Church is the Body of Christ (can it be possible to divide the Body of Christ? ), and finally, that the Church is the seamless robe of the Lord (which, although Arius tried, one must not divide). Russia, together with all the Slavic nations and lands, will constitute a mighty Tsardom (kingdom). At its helm will be an Orthodox Tsar, Anointed of God. The Tsar will be from God. All schisms and heresies will vanish in Russia. There will not be any persecution of the Orthodox Church. The Lord will have mercy on Holy Rus’, because in her there had been the horrible, terrible time preceding the antichrist. The great regiment of the Martyrs and Confessors has shown forth, beginning with the highest spiritual and civil ranks. Metropolitan and Tsar, priest and monk, children and even nursing infants, ending with laypeople. All these will beseech the Lord God the King of Hosts, the King of Kings, glorified in the Holy Trinity, Father, Son and Holy Spirit. One must firmly understand that Russia is one of the portions24 of the Queen of Heaven, and She cares for and intercedes for it especially. The whole choir of Russian Saints, together with the Mother of God, begs [the Lord] to spare and have mercy on Russia. 1 Most probably Ioann (Sokolov) (1877-1968), as he is mentioned elsewhere in this book.–Trans. 2 There was a nationalist movement afoot in Ukraine in the early 20th century, which caused a schism in the Church. 4 P. 135 of Life, Teachings, Prophecies and Akathist (LTPA). Page 185 of Life and Service to the Saint. –Trans. 8 St. Lavrenty was from what is now called (the) Ukraine; therefore, the word “our” here refers in particular to people living there—the word for native land there is “Rus’” and “Russian,” not “Ukrainian.” –Trans. 9 The King of Poland invited Jews to his country, finding it profitable, whereas in the Middle Ages or later many European countries had expelled their Jewish population, much of which then moved to Poland, where they were welcome. Thus, there was a high concentration of Jews in Poland, and they were indeed allowed to have great control and influence there. The word “secret” may have been used because they were still segregated from the Christian population in many ways, voluntarily or involuntarily. —Trans. 11 The Union of Brest (1595-1596), wherein many Orthodox bishops in Little Russia succumbed to Jesuit pressure and went over to the Pope of Rome. 12 Grigory Miroshnikov of Sednev, Chernigov, Fool-for-Christ. He lived at the beginning of the 19th century. 14 Leasing—arenda. System in the Polish-Lithuanian Commonwealth (which had annexed Kievan Russia), whereby a few oligarchs owned vast estates and even peasant villages. The landowners were unwilling to spend the time necessary to administer such vast holdings, so the commonly-accepted solution was to rent out one’s lands (hence, arenda) to Jews, who managed the lands and collected taxes for the owners. This was the same as the ancient Roman tax-collection method of Biblical times, whereby the tax collectors were not actually paid by the Romans, but who were allowed to exact more—sometimes much more—than the sum for taxes in order to “pay” themselves. The Jewish middlemen even collected taxes from Orthodox Christian clergy, often held the keys to the church, and not a singletreba (service of need, such as a wedding or baptism) could be performed without paying them. Russian Christian attitudes towards them were therefore similar to Jewish attitudes towards the tax-collectors (publicans) for Rome in the Bible accounts. 15 Samosviat—self-ordained group, not lawfully ordained by another Patriarch or bishop, but by one’s own self; a group not ordained by or recognised by the canonical and lawful Orthodox Church. Such an invalid ordination puts the group outside of the Church. 16 (This endnote is in the original book [Note 48], written by the compiler of that book:) “Now the Ecumenical (vselenskaya–of the whole inhabited earth) Orthodox Church consists of nine Patriarchates. In the order of the Diptych these are the patriarchates of Constantinople, Alexandria, Antioch, Jerusalem, Moscow, Georgia, Serbia, Romania, and Bulgaria; and the six autocephalous Churches headed by Archbishops (Cyprus, Greece, and Albania) and by Metropolitans (the Orthodox Churches in Poland, [then] Czecho-Slovakia and America)” (Protopriest Vladislav Tsypin. Tserkovnoe Pravo. Moscow:1994. P. 217). –Compiler of the Russian book. 17 The ROCA herself acknowledged this in the Epistle of 1927, Decision 3: “The part of the Russian Church that finds itself abroad considers itself an inseparable, spiritually united branch of the Great Russian Church. It does not separate itself from its Mother Church and does not consider itself autocephalous.” (from Archpriest Roman Lukianov; “The Path of the Russian Orthodox Church Abroad. Observations and Thoughts of an Old Priest”, OrthoChristian.com.) St. Lavrenty’s statements appear to be a prophetic response to some segments of the Russian Church Abroad who began to consider it to be separate from the Church in Russia, and to consider that after 1928 the Russian Orthodox Church somehow ceased to exist.—Trans. 18 Again, did St. Lavrenty foresee the FROC (so-called “Free Russian Orthodox Church”)—the name for the uncanonical presence of ROCOR parishes on Russian soil under Metropolitan Vitaly—which was in essence saying that none of the parishes and monasteries in Russia were Orthodox. 20 Pravoverie— “right faith,” which is basically another way to translate Ortho (right) doxia (praise or teaching). “Orthodoxy” in Russian is pravoslavie, and pravoverie is always used as a synonym. Immediately after the [Bolshevik] Revolution, many Jews were euphoric over their high representation in the new government. Lenin’s first Politburo was dominated by men of Jewish origins. Under Lenin, Jews became involved in all aspects of the Revolution, including its dirtiest work. Despite the Communists’ vows to eradicate anti-Semitism, it spread rapidly after the Revolution—partly because of the prominence of so many Jews in the Soviet administration, as well as in the traumatic, inhuman Sovietization drives that followed. Historian Salo Baron has noted that an immensely disproportionate number of Jews joined the new Bolshevik secret police, the Cheka And many of those who fell afoul of the Cheka would be shot by Jewish investigators.” (Louis Rapoport, Stalin’s War Against the Jews (New York: Free Press, 1990), pp. 30, 31, 37. See also pp. 43, 44, 45, 49, 50. as cited in The Jewish Role in the Bolshevik Revolution and Russia’s Early Soviet Regime: Assessing the Grim Legacy of Soviet Communism by Mark Weber). 23 Stalin was still alive at the time of this prediction. He died in 1953, three years after St. Lawrence.—Trans. 24 According to tradition, the four “lots” (zhrebiy, oudely) of the Mother of God on earth are: Georgia, Mt. Athos, the Kiev-Caves Lavra and the Seraphimo-Diveyevo Convent.